By now, the story of teenage metal trio UNLOCKING THE TRUTH (who walked away from a seven-figure deal with Sony) is well known. 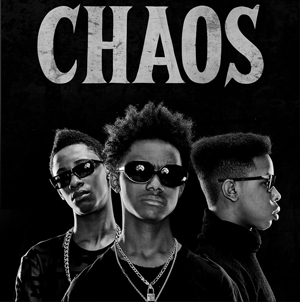 After years of media excitement, late-night TV appearances, and breakout sets at Coachella and Bonnaroo, the band's debut album Chaos was finally released independently last year. The Brooklyn-based band is now back with a new music video for their latest single "My Chains". The video (directed by JP Brasca) cuts through much of the hype surrounding the group and shows a different side of the band. "We wanted the video to show that UNLOCKING THE TRUTH has more to offer than just a good song," says guitarist/vocalist Malcolm Brickhouse. "The video and song both push the envelope for 'the norm' in metal music. It's fresh. It's new. It's "MY CHAINS"!" The track is a soulful metal hybrid, co-produced by Brickhouse (and Kenta Yonesaka, Germano Studio NY), who says "The meaning of "My Chains" will be different for everyone, but there's a line in the song for everyone. Think about it. We all have chains in life. It could be somebody or something we use as a crutch to help us get through life and loosen those chains." "My Chains" is available on Spotify and iTunes and you can watch the video on KNAC.COM RIGHT HERE.